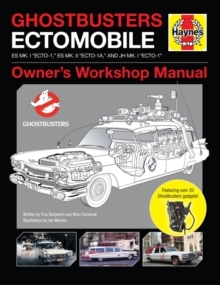 Officially licensed from Columbia Pictures, this Haynes Manual, based on the classic Ghostbusters movie franchise focuses on Ecto-1, the team's trusty spectre-smashing vehicle, plus the equipment that Ecto-1 carries. Along with a detailed breakdown of Ecto-1's capabilities and detailed cutaway images that show the car's souped up engine and in-built ghost-trapping equipment, the book also focuses on the Ghostbusters' portable tools of the trade, including proton packs, ghost traps and P.K.E meters. Featuring commentary from the film's ghostbusting team - Ray Stantz, Peter Venkman, Egon Spengler and Winston Zeddmore - the Ghostbusters Manual is the ultimate guide to the Ghostbusters iconic car and ghost trapping equipment.